i did it! i finished a quilt for em’s twin-size big girl bed! wanna see? 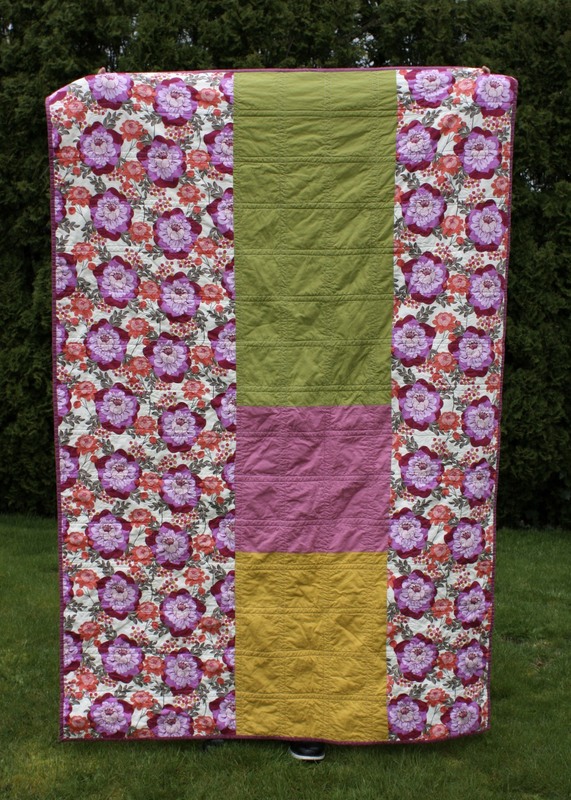 my goal was to keep the piecing as frustration-free as possible, so i went with 6″ patchwork squares in pinks and greens and yellows, since my little gal looooooves pink. most of my favorite fabric designers are featured. 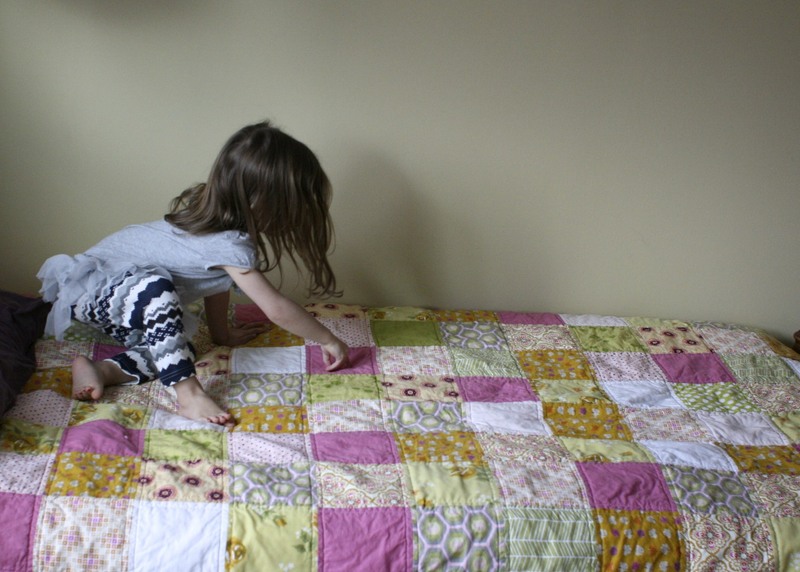 when em first saw the quilt top, she pointed to a valori wells square and said, “hey, that’s like my skirt!” and a heather ross square and said, “hey, that’s like my pillow!” and a solid and said, “hey, that one’s pink, it’s my favorite color!” i loved that she was so excited. a neat thing happened when i was picking out the main backing fabric. i knew i wanted a large floral that reflected the colors of the front. i came across this print and really liked it, and then noticed the designer was sandi henderson. the first little flannel/minky blanket that i made for em was from her ginger blossom line, so i thought it was a really nice coincidence and had to go with it! there are even tiny golden flowers with green stems, so it coordinates perfectly. 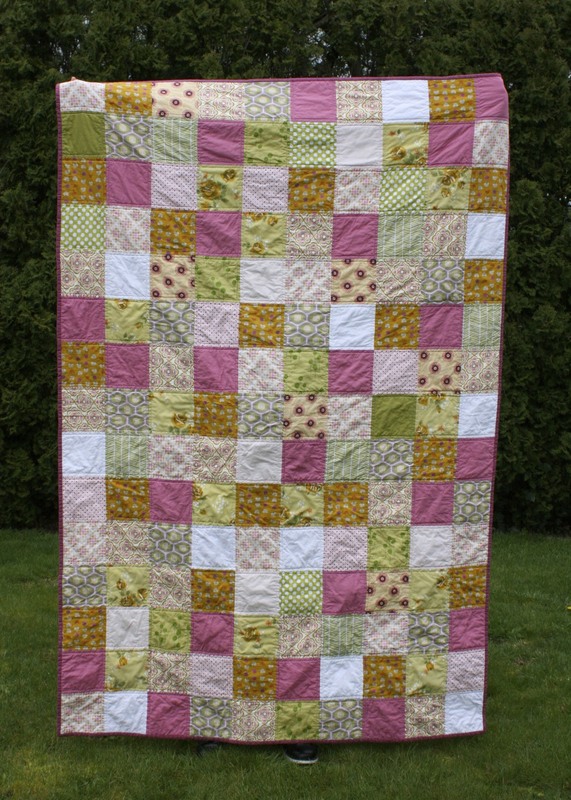 i pieced it with solids from the main colors of the front – lime green, pink, and yellow. i quilted it 1/4″ on either side of each seam with my walking foot, following this example from film in the fridge. then i sewed on the deeper rose-colored binding using the method from elizabeth hartman’s “the practical guide to patchwork,” machine-sewing the binding onto the front, then wrapping it around and hand-stitching it to the back using an invisible ladder stitch. elizabeth’s instructions were perfect, and i finally grasped the proper method of mitering corners which i’d been sort of faking before. i thought the hand-sewing would be really tedious and terrible, but it actually did become theraputic and enjoyable once i got in a rhythm. i was so excited that the stitches were actually invisible! the hand-stitching was definitely worth the time and sore fingertips. the finish is so clean and pretty. i washed it up last night, and was pumped to put it on em’s bed today! here it is, all loaded up with her favorite animals, pillow pet, and guard-rail for her crazylegs sleep habits. we’ll often find her sleeping parallel to her pillow. here she is pointing to her favorite fabric on the quilt. i’m not a huge pink gal, and actually avoided dressing her in too much pink when she was a baby, but she has claimed it as her favorite color as a toddler, so who am i to argue? now snuggled up and faking sleep with her favorite buddy, frankie the elephant. oh so cozy under her new mama-made quilt! 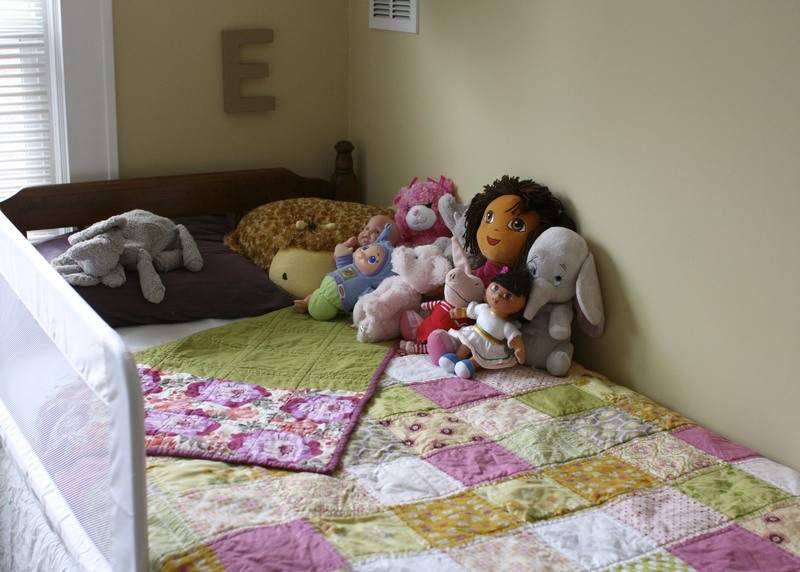 finishing this project was a huge accomplishment for me – i was really intimidated by making a bed-sized quilt. i consulted quilt books, the internet, my mom (thanks, mom!) and good friend erin (thanks, erin!) as i made my way through the process. with each step that worked out well, i breathed a huge sigh of relief! going straight for a twin-size was pretty ambitious, but i really wanted to make this for em’s bed, and i’m so glad i did. she is so excited about it, too, and for a sewing mama that is really the best i can hope for. however, i AM looking forward to sewing something smaller-scaled and, uh…curvier. oliver + s bubble dress for easter? YEP! I’m not much into hand sewing but I actually like sewing the binding down. 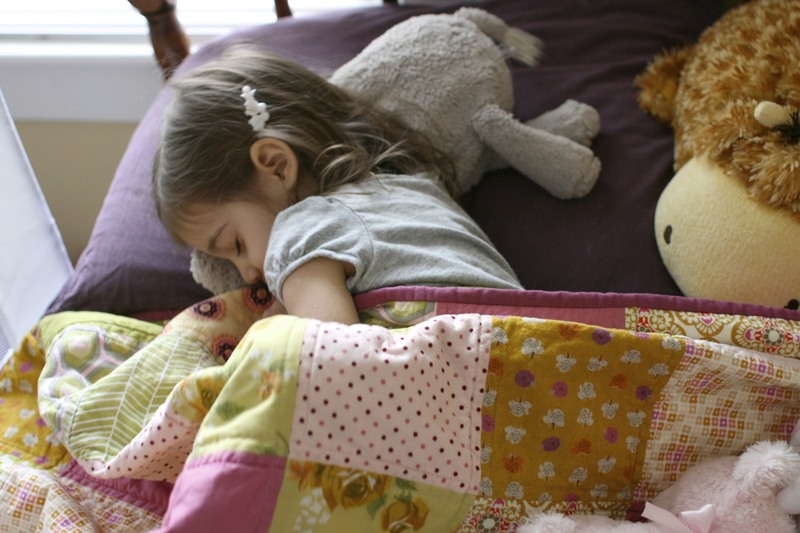 She’ll still be lovin’ her quilt 20 years from now and you’ll have made tons of quilts by then! Beautiful quilt and nobody would guess it was your first. p.s. Besides being relieved to have finished, have you also started planning future quilts? I hear it’s addicting! THANKS! Yes, it’s so addictive. 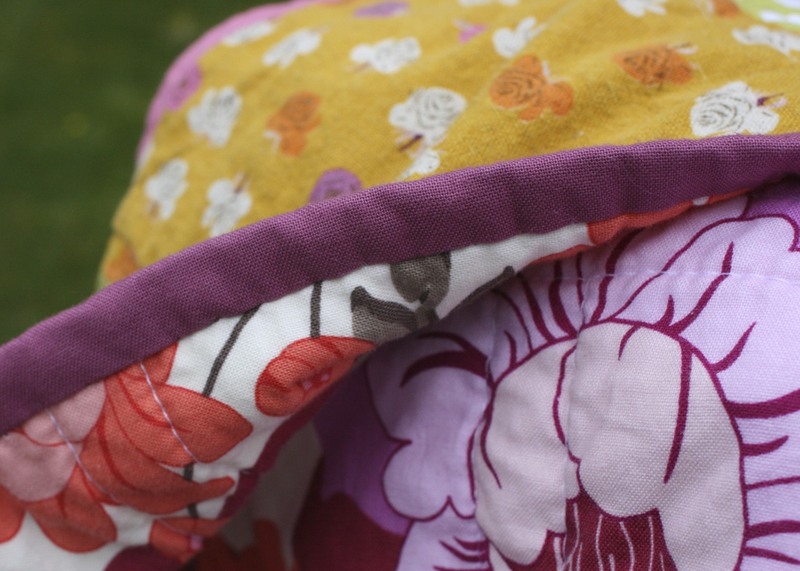 I’m already planning a smaller “playmat” sized quilt for Oh – maybe zigzags? The steps were really fun, and it’ll be cool to experiment with design if the quilt itself is a smaller scale…the bulk and sheer size are what got a little cumbersome with this one as a starter quilt.